As soon as the team agreed for a design, we decided the format of the Christmas-card. Then the printing of two different layouts for DinA 4 and DinA 5 could be done. Afterwards we made a proof of them and adjusted to the layout minor detail. An additional bleed margin had to be included on the side. The next step was to produce the small non-printed electronic cards. According to the successful print we were able to finish the project by printing the electronic Christmas-cards.The front- and back-page were printed separately , which we glued together afterwards. We defined a bleed for each side- without crop marks, register marks or check marks- and trimmed it afterwards. 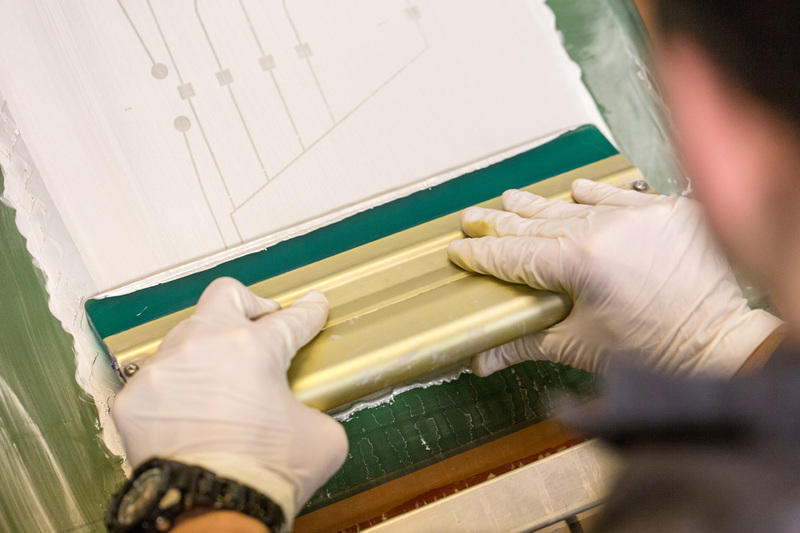 Before the conductor paths were printed by a silver ink, we created an unique screen. Both processes caused wastepaper, which we kicked out due to a perfect printing result.